In the 1920s and 30s quite a large number of retiring shipmasters who had started their careers in sail were writing their memoirs, while authors like Basil Lubbock, conscious that the days of commercial sail were effectively over, published popular and factual books about the ships, their captains and crews, so the general public were more or less aware of what life in sailing ships had been like. Not so in the last four or five decades. There has been a bit of a revival of sail in the form of the training ships of the international Tall Ships flee but nevertheless we have become quite ignorant of the nautical world, past and present (except for huge cruise ships). It is therefore refreshing to read a factual account of the voyages of a real ship and her crew in the early years of the twentieth century. This book describes the voyages of the French barque Montebello from her launch in 1900 to her loss on Kangaroo Island, South Australia in 1906, along with adventures of her crew and the subsequent careers of the two captains, Marchandeau and Kervegan who had commanded her. The Montebello was a first class steel sailing vessel of the French “bounty fleet”. In 1888, France introduced the Navigation Bounty Act to build up her merchant marine and shipbuilding industries. The act provided subsidies to builders of steel ships and to ship owners. It resulted in the creation of a magnificent fleet of steel windjammers, some with four or five masts. The Montebello, however, was a three master, slightly larger than average for her day. She was owned by the firm of Guillon et Fleury of Nantes who operated fifteen ships at that time. Mr. Simpson has explained the bounty system very clearly. One of the provisions of the Bounty Act was that the at least three fourths of the crew had to be French citizens (in the Montebello they all were). French sailors on bounty ships were comparatively well paid and received a pension after twenty-five years at sea. In return they provided a ready reserve for the Navy, which practised a partial mobilisation every year. At that time, British and American sailing ships had citizen captains and officers but polyglot crews, often put on board drunk or drugged by the boarding house crimps just before sailing (See John Masefield’s more miserable poems to get the flavour of it). But French sailors who tended to hail from the same Breton regions and enjoyed better food and pay were generally immune to the blandishments of the boarding house runners and the Montebello never lost a man to them. That is not to say that they had an easy time of it. The Montebello was still a small ship by today’s standards and she sailed the stormy southern ocean on her way to Australia and around Cape Horn. They had to draw upon their ultimate resources in energy and seamanlike skills just to survive. On slow passages, food could be nearly exhausted. The way the author, who obviously had access to the logbooks, has traced all these long voyages gives the reader a true picture of what it was like for the crew of a sailing ship in the early years of the last century. A notable feature of the book are the illustrations which include many representations of the ports and loading berths mentioned in the text. These are all contemporary with the story; many are old postcards. There are photographs of the wrecks of the Montebello and the Croisset as well as of the ships and crew members. There are, as is inevitable, a few typos but this is a most interesting, well researched, little book. Paul W. Simpson. 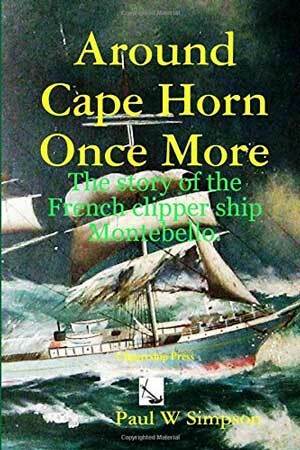 Around Cape Horn Once More: the story of the French clipper ship Montebello. Adelaide, South Australia: Clippership Press, 2016. 125 pp., illustrations, bibliography, index. ISBN 9781365112010.